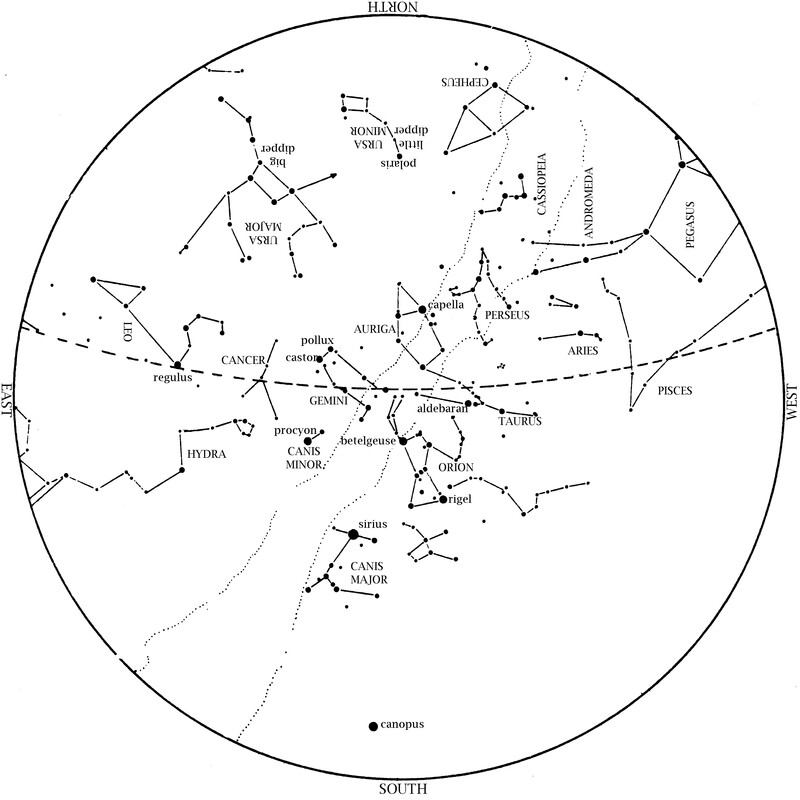 This star map shows the Houston sky at 9 pm CST on February 1, 8 pm CST on February 14, and dusk on February 28. To use the map, put the direction you are facing at the bottom. Jupiter is almost due south at dawn; it outshines all the stars we ever see at night. Mars is in the south-southeast at dawn. It brightens a little each morning as moves away from Jupiter and towards Saturn. Venus is lost in the Sun’s glare and invisible for much of the month. By the 28th, see if you can find it low on the horizon during evening twilight. 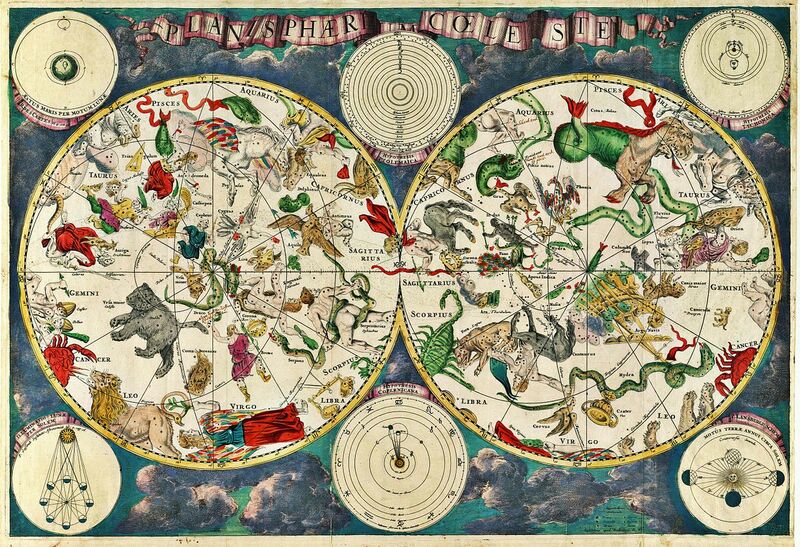 A celestial map from the golden age of Netherlandish cartography, by the Dutch cartographer Frederik de Wit. Source: Wikimedia Commons. Taurus, the Bull is high in the south. Look for the Pleiades star cluster above reddish Aldebaran. Dazzling Orion, the Hunter takes center stage on winter evenings. Surrounding Orion are the brilliant stars of winter. Orion’s belt points down to Sirius, the Dog Star, which outshines all other stars we ever see at night. The Little Dog Star, Procyon, rises with Sirius and is level with Orion’s shoulder as they swing towards the south. To the upper left of Orion’s shoulder is Gemini, the Twins. The sky we see depends on our latitude as well as on the time of night and time of year. From any given location in our hemisphere, stars in an area of the sky around the North Star never set (circumpolar stars), while stars in an equivalent area around the South Celestial Pole never rise. The closer you are to the pole, the larger these areas are. The closer you get to the equator, the fewer circumpolar stars there are, but there are also fewer stars that never rise for you. At the equator, no stars are either circumpolar or never visible; all of them rise and set as Earth turns. That’s why, down here in south Texas, the Big Dipper sets for a while although it’s always up for most Americans. On the other hand, Canopus, too far south to rise for most Americans, rises for us. 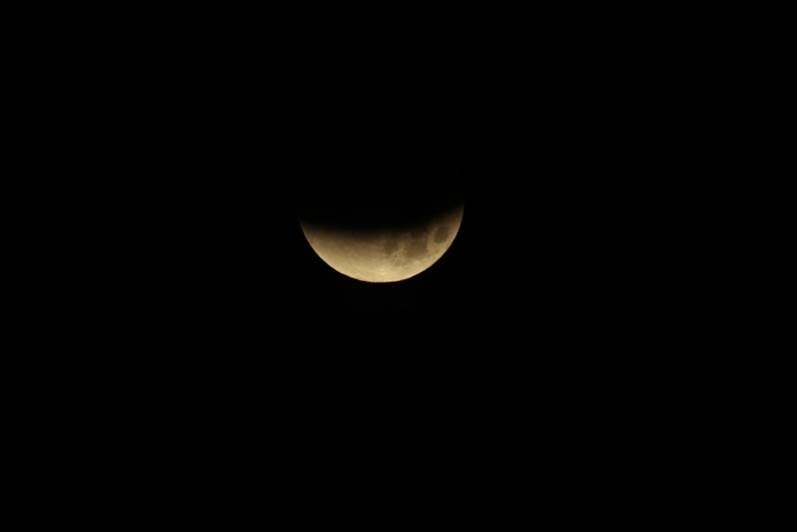 Image of last month’s lunar eclipse, taken by members of our Astronomy team. Last Quarter Feb. 7, 9:54 a.m. New Feb. 15, 3:05 p.m. Note that there is no Full Moon in February. At 28 days long, February is the only month shorter than the 29.5 day lunar phase cycle. Thus, if a Full Moon occurs on January 31, as was the case with the ‘Super Blue Blood Moon’ this year, the next Full Moon is on March 1. The New Moon of February 15 partially blocks the Sun, but only as seen from Antarctica, Chile, Argentina, or Uruguay. That’s the general pattern; if there is a really good alignment for a lunar eclipse, like the one on January 31, two weeks later at New Moon the Earth-Moon-Sun alignment is only so-so.